Kim Jong-il’s Slush Fund Woes? Bureau 39 has been dubbed Kim’s own slush fund. A chain of eateries offers a glimpse into how the North Korean body makes cash. Bureau 39. It’s the shady, money-making arm of the North Korean government and is believed to engage in a range of illicit activities including the manufacturing and trafficking of heroin, peddling of fake US banknotes and arms sales. Part of the North Korean Workers Party, Bureau 39 has been described as Kim Jong-il's personal slush fund. But it’s about to feel the pinch from tougher US sanctions unveiled this month over the country’s nuclear programme. And these sanctions could also hit one of the more curious arms of this spidery operation—its popular chain of restaurants. The Pyongyang group of eateries boasts known spots in Phnom Penh, Cambodia, Beijing, Kathmandu and Laos. There are said to be as many as 100 North Korea-themed restaurants across Asia, though how many are controlled by the government remains unclear. But for a country obsessed with self-reliance and secrecy, what little is known about this capitalist endeavour still offers a rare glimpse of what lays behind its tightly guarded borders. Serving such delicacies as dog meat (dangogi), cold buckwheat noodle soup (naengmyeon) and the ubiquitous Korean favourite kimchi (pickled cabbage), the restaurants attract an eclectic clientele including South Korean tourists, Chinese businessmen and even some curious Westerners. Diners are served by pretty North Korean waitresses who can sing and dance, with some even speaking quite good English. The Pyongyang eateries are known for being friendly but a little pricey and it’s unclear where exactly any profits go. Still, the ultimate destination of the cash spent in the restaurants hasn’t put customers off visiting. ‘I didn’t object to paying (what I did) for my meal, or feel that I was supporting a tyrant,’ says Don Douglas, an American NGO worker who recently ate at a branch in Kathmandu. Like many people who go there he says he wanted to try it once to satisfy his curiosity. Yet crossing the line is exactly what some staff members have been trying to do. 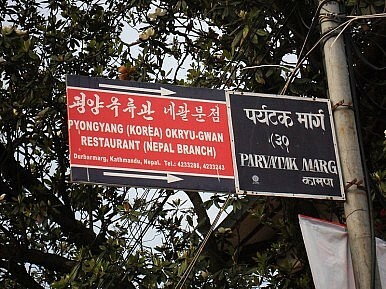 The temporary shutdown of two restaurants was due to incidences of staff members fleeing, one defector identifying himself as a former manager of a Pyongyang branch told the Daily NK. According to another source, a branch in Cambodia was closed temporarily when a local diner attempted to coax a waitress off the premises. But attempted ‘defections’ aren’t the only reason North Korea’s dalliance with culinary capitalism appears to be foundering. Ironically, the restaurants—once confined to the regions of China that hug the North Korean border—grew out of a cash crisis in the early 1990s, when communist allies Russia and China started to demand payment for goods in cash rather than through barter. As the regime grew more desperate for cash, the chain spread into Southeast Asia and other parts of the continent, the first opening in Siem Reap, Cambodia, in 2002. Can Capitalism Take Off in North Korea? Flirtations with capitalism need to overcome a rigid ideology.